Guild Park and Gardens is a public park in the Scarborough district of Toronto, Ontario, Canada. The park was formerly the site of an artist colony and is notable for its collection of relics saved from the demolition of buildings primarily in downtown Toronto arranged akin to ancient ruins. Located on the Scarborough Bluffs, Guild Park and Gardens has an outdoor Greek stage and a 19th-century log cabin among the oldest in Toronto. The principal building in the park is the Guild Inn, a former inn and estate mansion. The park is located on Guildwood Parkway, east of Eglinton Avenue East and Kingston Road. Its 50 acres (20 ha) is accessed from the parking lots of the Guild Inn itself and from a parking lot for the Lake Ontario access trail, just to the east. The park is mostly forested. South of the Inn is a large area of grassy, open space. To the east, a ravine leads down from Guildwood Parkway to Lake Ontario. Along the bluffs, an east–west trail connects to Livingston Road to the west, with several points for viewing the lake. The edges of the bluffs are roped off for safety, as the bluffs are tall and composed of soft, sandy, unstable material. The park is managed by Toronto Parks, on land that is the property of the Toronto and Region Conservation Authority. It was formerly known as Guildwood Park. It became a park after the Guild Inn and its property was bought by Metropolitan Toronto and the Government of Ontario in 1978 from Rosa Hewetson Clark and Spencer Clark. The Inn continued to operate until it closed in 2001. It was managed by various hotel management companies, including Delta Hotels, Canadian National Railway and others. It was first the "Ranelagh Park" estate of Col. Harold Bickford, then it became the China Mission Seminary, and the "Cliff Acres" estate of Richard Look, before it was bought in 1932 by Rosa Hewetson, who, along with her husband Spencer Clark converted it to "The Guild of all Arts" artists' colony and inn. During World War II and for a period afterward, it was used by the Government of Canada. From the 1990s onwards, the property was the subject of several redevelopment proposals, which failed or were rejected. The City of Toronto developed a management plan in 2014 for the park and gardens. The plan intends to preserve the park, protect the forest, bluffs and lakeshore, and maintain the heritage buildings (inn and cabin). The inn was restored, part of a new facility for weddings, meetings and gatherings. One new wing is a banquet hall. Another new wing includes meeting rooms. In the late 1950s and later, older buildings in downtown Toronto were being torn down and replaced. Many of these had been standing for many decades and had been well-constructed, with stonework of a high quality and were considered historic to many. A movement to support the preservation of older buildings began in response to the amount of demolition, but it would not be until the 1970s that governments would pass laws that protected buildings considered to have 'heritage' status. Rosa and Spencer Clark responded to this wholesale demolition by taking away remnants of the buildings from the demolition sites. They enlisted engineers, architects and hired stonemason Arthur Hibberd, and erected the remnants in the Guild gardens. Remnants of over 60 buildings from Toronto and elsewhere in Ontario exist in the Guild gardens, the front gate of the Guild Inn, and the front gate of the Guildwood Village neighbourhood. The Greek Theatre is an open-air theatre, built from the remnants of a Bank of Toronto. To commemorate the 50th anniversary of the Guild Inn, the Clarks built an open-air theatre from remnants of the Bank of Toronto building, at a cost of CA$300,000 to Spencer Clark. The Bank of Toronto building had stood at Bay and King Streets in downtown Toronto since 1912, until 1966, when the Toronto–Dominion Centre was built. Eight marble columns, plus Corinthian capitals and arches were repurposed along with a concrete stage and steps to form an open-air theatre under the supervision of Hibberd. There were also plans to build an amphitheatre in front of the stage, but it has not been built. Seating is either on the grass or using chairs. Stonework from the William H. Wright Building, one of many architectural relics display at the park. Relics at the park may be arranged in different patterns, such as the relics from the Old Toronto Star Building. Panels of the Provinces - twelve panels for each of the provinces and two territories, topped by a filial from the entrance gate to Victoria Park in Niagara Falls. According to Walker 1982, one of the entrances to the T. Eaton Co. Ltd College Street store was saved and taken to the Guild in 1976. Various other pieces of stone, marble and terra-cotta were also taken to the Guild by Clark. However, they remain un-erected. To the west of the Guild Inn property exists Osterhout Log Cabin, one of the oldest buildings in Toronto. To the west of the Guild Inn property exists an 1800s-era log cabin, known as the Osterhout Log Cabin. The actual date of its construction is unknown. In 1795, surveyor Augustus Jones and his surveying team camped in the area and could have built a log cabin on the property while he surveyed Scarborough. However, Jones' accounts stated that they stayed in tents. In 1805, the property was granted to William Osterhout, but there is no record of a log cabin during the time Osterhout lived on the property. The property was later owned by Alexander McDonnell, Duncan Cameron, and John Ewart. James Humphreys bought the property in 1845, and his son and family are the first recorded residents in the cabin, in 1861. The property was bought by the Clarks in 1934. As part of the 1978 sale of the Guild property, the land around the cabin came under the administration of the Conservation Authority. In 1980, Scarborough designated the cabin as the Osterhout Cabin, and granted it protected heritage status. Some test pits were dug around the cabin in 1994 to determine its age. Artist Elizabeth Fraser Williamson used the cabin as a studio from 1970 to 1995. In addition, the park previously held three three cottages, as well as two other buildings, Corycliff, and The Studio. The park has been used in recent pop culture pieces. Martha and the Muffins filmed the video for "Danseparc" here. The Guild Inn and surrounding area were used in the filming of "The Skulls", the Warehouse 13 Pilot and "Endless Terror" episodes, and even in the popular artist Drake's music video for his hit song "Headlines". The television series The Whiteoaks of Jalna was filmed at the cabin, and appeared in the movie It Seemed Like a Good Idea at the Time. It has also been used for other television projects. Walker, Hugh (1982). The Spencer Clark Collection of Historic Architecture. Scarborough, ON: The Guild. ^ "Management Plan for Guild Park and Gardens" (PDF). toronto.ca. City of Toronto. Retrieved October 12, 2016. ^ Flack, Derek (November 27, 2015). "Long neglected Guild Inn to get full heritage restoration". Blogto.com. Retrieved September 30, 2016. ^ Pelley, Lauren (September 7, 2015). "Guild Inn restoration set to begin soon". Toronto Star. Retrieved October 5, 2016. ^ a b Lidgold 2000, p. 259. ^ Lidgold 2000, p. 261. ^ James, Royson (June 26, 1984). "Folk music show is first performance at Greek Theatre". Toronto Star. p. G14. 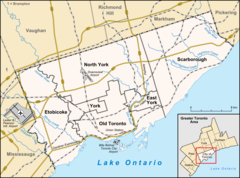 ^ "Scarborough news | News, sports and events from your Scarborough community". InsideToronto.com. September 23, 2016. Retrieved September 30, 2016. ^ a b c Lidgold 2000, pp. 257–309. ^ Walker 1982, pp. 5–45. ^ Walker 1982, pp. 44,46–47. ^ James, Royson; Masse, Linda (October 8, 1984). "Guildwood a secluded 'oasis'". Toronto Star. p. A6. ^ Lidgold 2000, pp. 201–202. ^ a b c Lidgold 2000, p. 204. ^ "Sculptures draw on nature and myth-making: Daughter of Guild Inn artist sells sculpture castings". Scarborough Mirror. Retrieved October 4, 2016. ^ "Drake - Headlines (Explicit)". YouTube. October 21, 2011. Retrieved September 30, 2016.